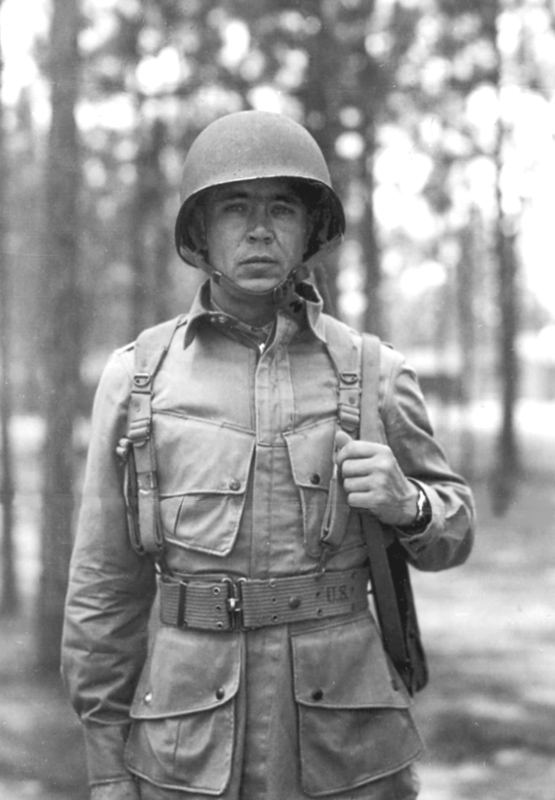 It has come to our attention that the City of Eindhoven in The Netherlands commemorates the men of the 101st Airborne Division who gave their lives for its freedom. Twenty-two names appear on a commemorative plaque in a modest but elegant park with other monuments in relation to the 101st Airborne Division. It can be found on the corner of John F. Kennedy Laan and Airborne Laan in Eindhoven’s northern suburb of Woensel. The plaque was unveiled on the 18th of September 2004 and was an initiative of (then-) councilman Jan van Hout; who has been a source in several of our cases. A close study of each name on the plaque revealed that eleven of these young Americans were actually killed in Eindhoven on the 18th of September 1944, the day the city was liberated. 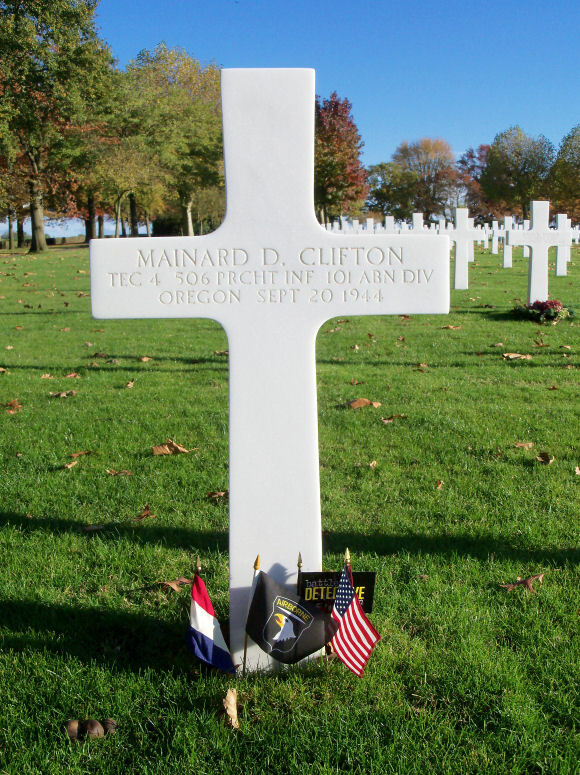 The other eleven soldiers either were killed on the previous day, D-Day of operation "Market Garden", or shortly after the city fell into Allied hands. Their deaths were caused by actions to consolidate the city’s defense or they died of wounds sustained during the Nazi-bombing raid on Eindhoven on the 19th. An even bigger number of paratroopers was wounded during the liberation of Eindhoven; some of them seriously. These facts inspired the idea of creating an as-accurate-as-possible "List of Casualties among US Paratroops during the capture of Eindhoven, Holland, September 1944". 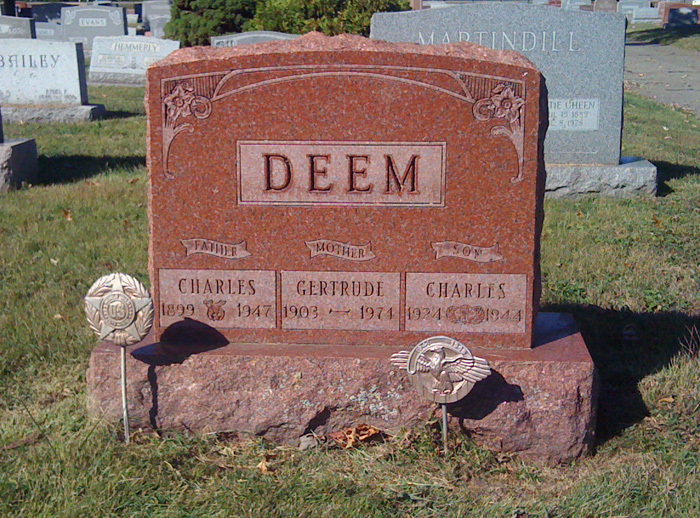 The title of this casualty list calls for a definition with clear specifications. First, it has to be evident that we do not wish to criticize any entry on the list of casualties on the plaque. Our investigation revealed that as far as we can determine, every paratrooper killed in action in Eindhoven on the 18th of September 1944, is mentioned on the plaque. The other men too, died in Eindhoven or the general area around the city. 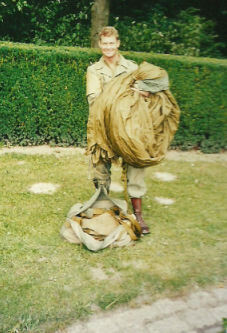 But there were also sky soldiers who paid with blood, pain and even physical and psychological limitations in their post-war lives. "The names of all 22 men on the plaque on Airborne Laan and all other paratroopers of the 506th Parachute Infantry Regiment who were either Killed In Action (KIA), Wounded In Action (WIA), Seriously Wounded in Action (SWA) or Missing In Action (MIA) when this unit was deployed within the territory of the Municipality of Eindhoven, capturing this city, establishing a bridgehead around it and defending it from 18 SEP 1944 to 20 SEP 1944"
We have discovered two more troopers who Died Of Wounds (DOW), two Seriously Wounded in Action (SWA), 26 Wounded in Action (WIA), 18 Killed in Action (KIA) and two casualties of an unknown nature. Fortunately we have not discovered any troopers Missing in Action (MIA). The list contains already known details, such as name, rank, Army Serial Number (ASN) and unit. 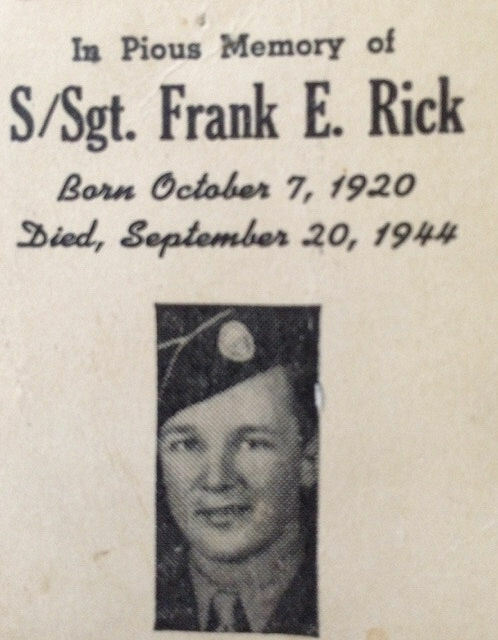 But we have also added details about the individual soldier, such as how he was killed or wounded and a photograph, if available. 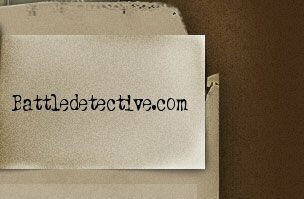 And we have also listed our sources. 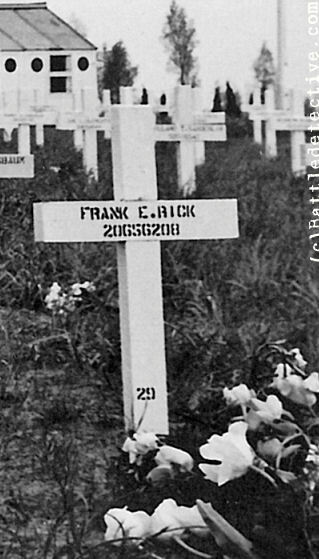 Source: Listed monument plaque on Airborne Laan, Eindhoven & confirmed in literature, U.S. Army records. 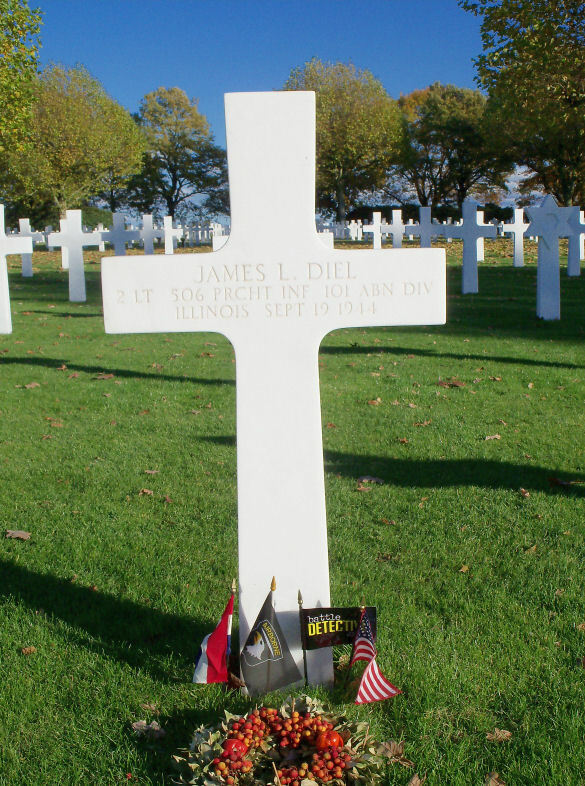 Details / Remarks: Killed by explosion of enemy by hand grenade / Buried in home state Indiana / In Pulles Rosters listed as MILLER "James" W.
Grave at the Holey Cross Cemetery and Mausoleum in Milwaukee, WI. 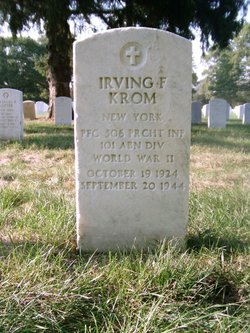 Details / Remarks: Killed during bombing raid Eindhoven (presumed), buried in home state Indiana. 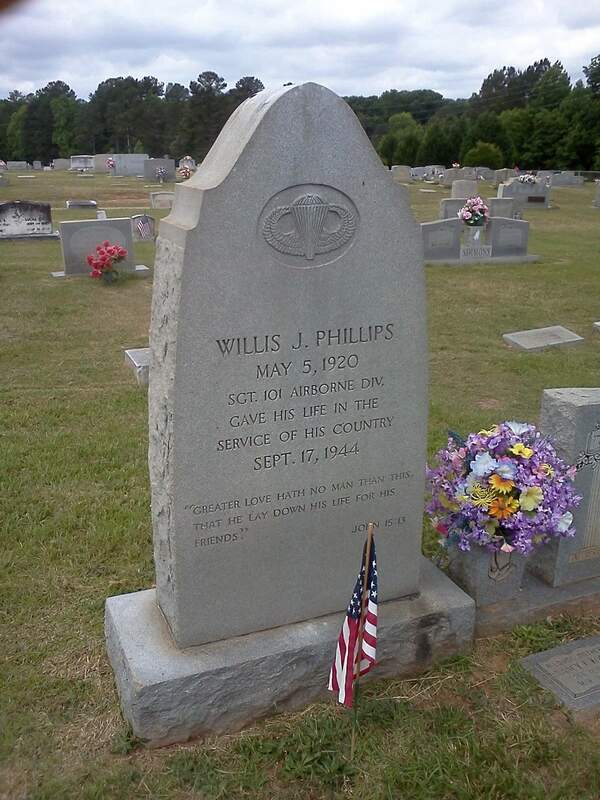 Exhibits: Willis Philips grave in Clinton, South Carolina. Our investigation led to the names of the following paratroopers who Died of Wounds and were Killed or Wounded in Action within the municipal limits of Eindhoven, The Netherlands. Name: BARRET, Henry N Jr. Source: The Pulles Rosters / Michel Detrez & Peter Hendrikx, "Orange is the Color of the Day"
Details / Remarks: CPT BROWN was WIA in the shoulder by a ricochet. 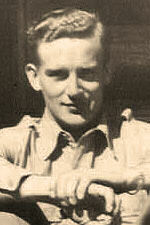 He recovered and joined his unit on 29 OCT 1944. Exhibits: Photograph by John Reeder of CPT BROWN with a casualty tag on his uniform waiting in Eindhoven to be evacuated by a horse dawn cart. 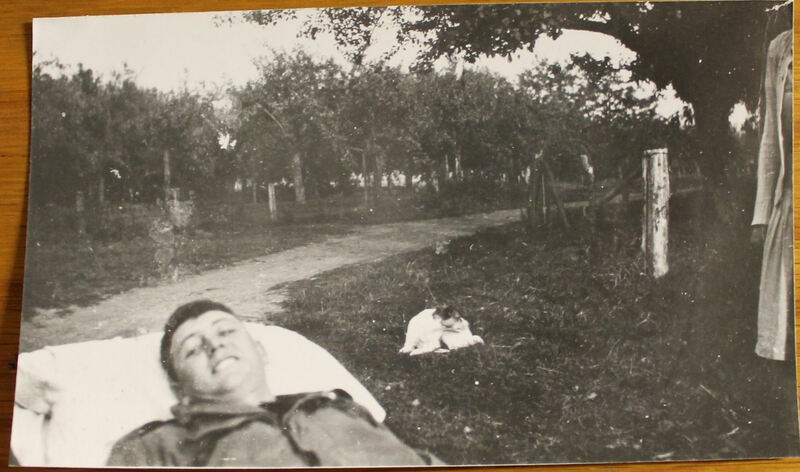 Details / Remarks: On 1 NOV 2012 we found a photo in the archives of the Don F. Pratt Museum in Fort Campbell, Kentucky. 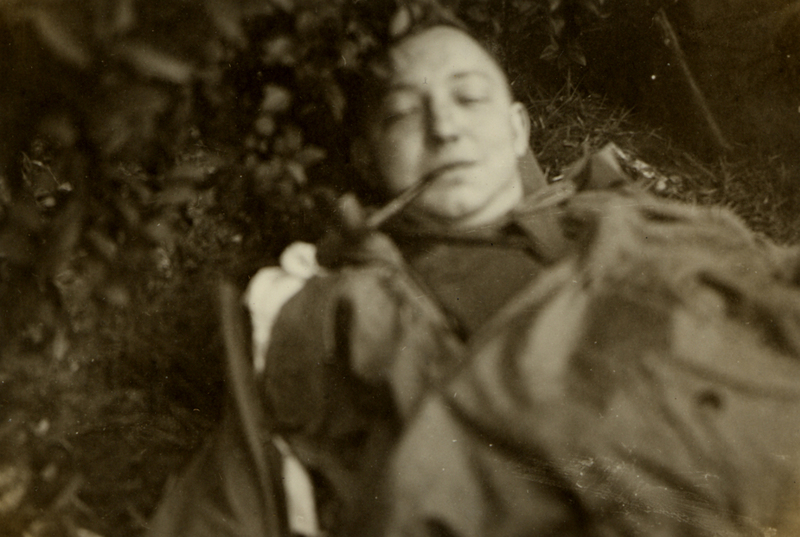 Exhibits: Photograph showing a wounded soldier on a stretcher in what appears to be a garden. A small pet dog is visible as well as a woman, although partially. The caption in typed print on the back side of the photograph reads: "Paul Jackson 506. 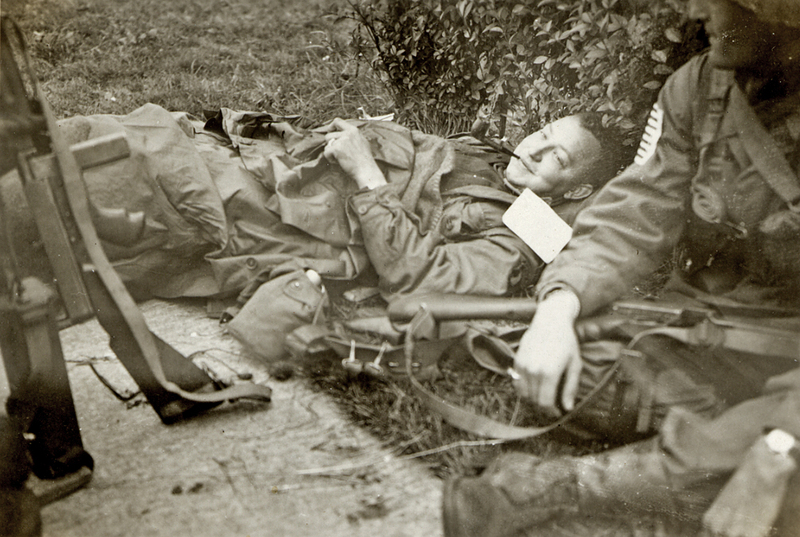 Eindhoven Sept. 18 1944 after being wounded." We then expanded our search to troopers who became a casualty when their unit was deployed in Eindhoven and was establishing a bridgehead around this city from 18 SEP 1944 to 20 SEP 1944. 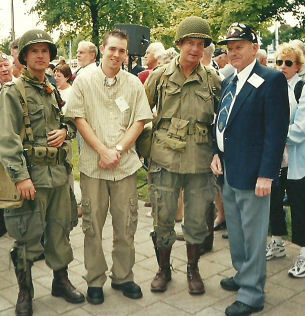 Name: BROWNLEY, Arlo J Jr.
Name: WINCENCIAK, Anthony M. Jr.
Each year, on the Sunday nearest the 18th of September, the Society of Dutch Airborne Friends has a ceremony at the Monument on Airborne Laan in Eindhoven, like the one during which the plaque was dedicated in 2004. A traditional part of the ceremony is the reading out loud of a list of names. 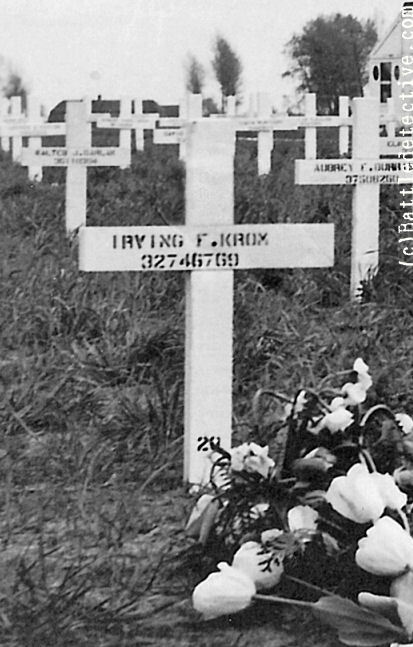 Names of paratroopers of the 506th who gave their lives for the liberation of Eindhoven. Close scrutiny of this Roll of Honor showed that it lists the 22 names on the plaque and seven more troopers. 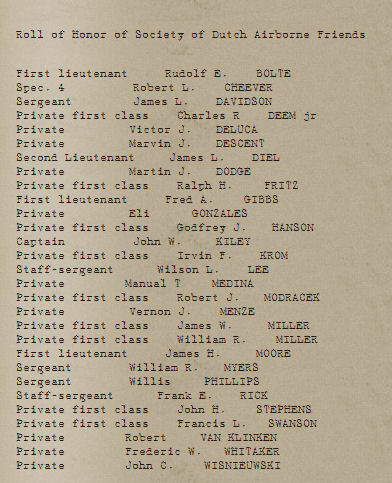 SSGT Wilson L. LEE’s name does not appear in the "Pulles Rosters" for the 506th. With regards to “PFC MILLER, James W” listed in the Honor Roll we discovered an error. 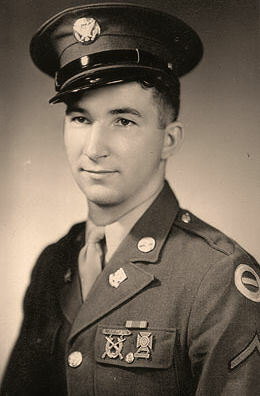 A comparison of the Army Serial Number of PFC James W. MILLER in the Pulles Rosters with the Enlistment Records in the National Archives revealed that it should be “John” W. MILLER; the previously listed Casualty # 5. 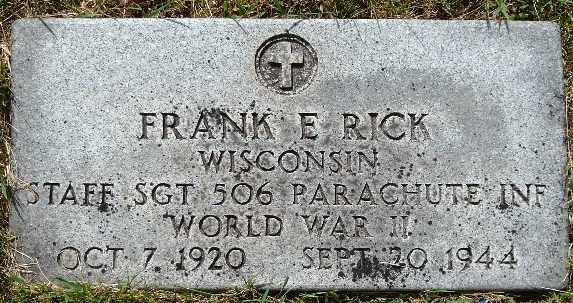 The other men all died on the 19th of September 1944. 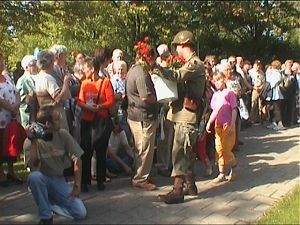 On that day, the 506th was in the Eindhoven area and therefore these men must have met their deaths there. The task of drawing up a complete list of all the American casualties, sustained in the liberation of Eindhoven, is a difficult one. "Trying to make that complete list can drive you mad!" We, however, tried and at least came up with the stories of 71 men who came all the way from their homes in the United States of America to liberate a people they had possibly only heard about in history lessons and nevertheless gave their blood or even their lives for this people's freedom. After listing the men named on the Airborne Monument in Eindhoven and the names of further casualties according to the Pulles Rosters, the seven additional names on the Airborne Friends' Honor Roll were added. Seventy-one recorded instances were found of soldiers of the 506th Regiment who got wounded or killed during the Regiment's deployment in the Greater Eindhoven area. The unknown soldier killed in casualty No. 49 and the 3 unknown soldiers wounded in casualties No. 's 46, 47, and 48 are unconfirmed and may result in a double count of confirmed casualties. Therefore it is safe to say that the 506th Parachute Infantry Regiment sustained 67 casualties in capturing and holding the city of Eindhoven.